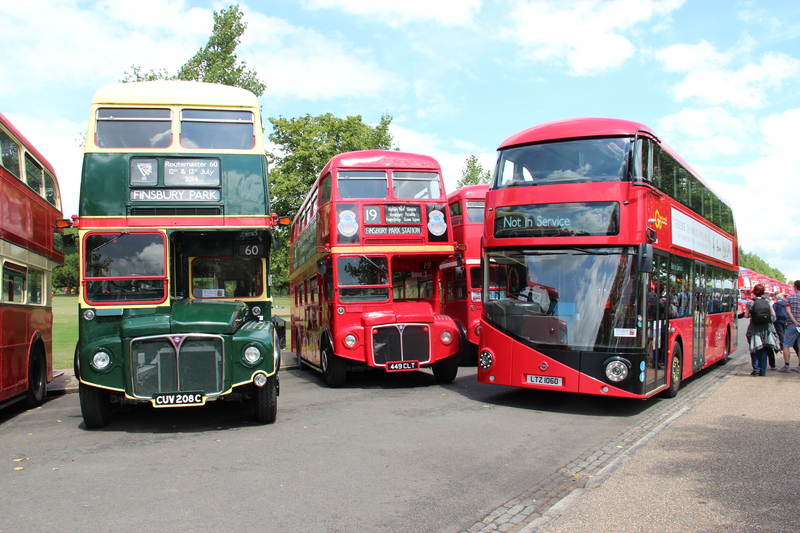 RM 1, first in the fleet of London’s most iconic buses celebrated it’s first sixty years in style by throwing a party for it’s mates in Finsbury Park on the 12th and 13th July 2014. 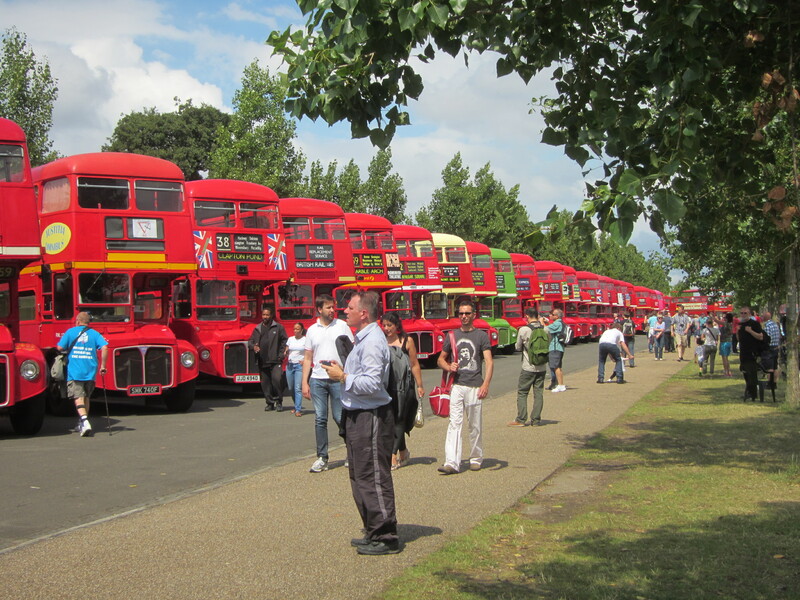 A total of one hundred and thirty seven of it’s Routemaster buddies turned up for the bash in a range of colours all parked side by side, some converted to mobile homes or hospitality vehicles, but most preserved as working London buses. The first prototype, RM 1, was unveiled to the public in 1954. It was then involved in a number of rigorous tests and trials more fitting for Concorde or the Space Shuttle than a humble bus before finally being put into service two years later. The next two prototypes appeared in service in 1957 and 58 respectively, while the fourth, CRL 4 built as a Green Line Coach went into service in 1957, but it wasn’t until 1959 that the production Routemasters went into service en mass, at which point the first three prototypes were withdrawn and relegated to the training fleet. There were several teething problems but after a few years these were ironed out as the Routemaster became the bus loved by Londoners and admired across the world as a symbol of our capital city. Over the weekend millions of bus admirers were joined by countless Londoners all coming to pay homage to the bus that took them to work or school, on shopping trips to the West End, days out to the Zoo or the Tower Of London, or even for a ride in the country or to Windsor Castle by Green Line. Routemasters gradually started disappearing from the London streets in the mid 1980’s, with the end finally coming in November 2005. From then on a small fleet of ‘Heritage’ Routemasters (re-engined and slightly modified) stayed on to run short journeys on tourist routes 9 and 15 across central London. But while visitors to the city would chose to ride on them instead of the normal modern service bus, they could never be the same. As I write this, the Heritage vehicles are coming off route 9, it’s been noted that the tourists now want to ride on the New Bus For London (aka the ‘Borismaster’ or it’s official title ‘New Routemaster’) and maybe that’s a good thing. It would be wrong to mourn the passing of an icon when it now has a very worthy successor with all the qualities of it’s predecessor, waiting to show us what it’s got. 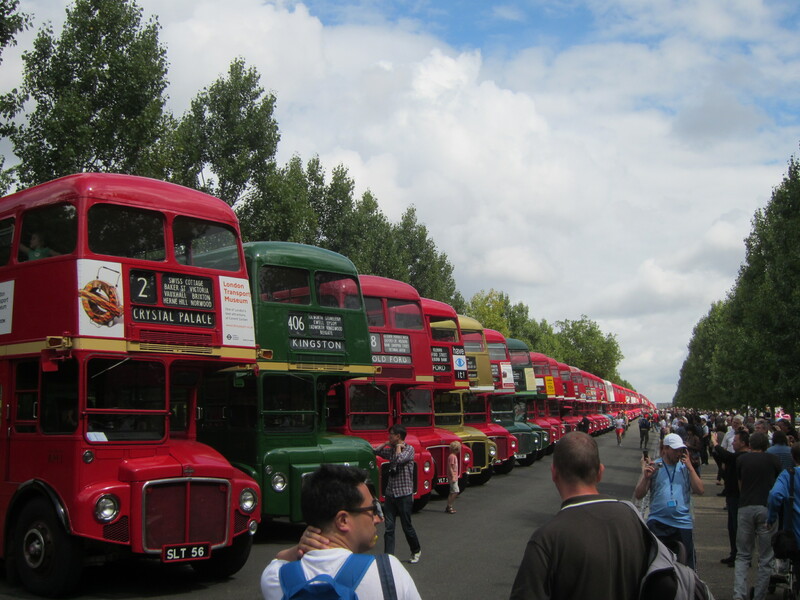 The Routemaster 60 celebrations at Finsbury Park proved that the travelling public will never forget the bus that they loved. With at least one hundred and thirty seven of them in preservation, there will be plenty of opportunities to reminisce about them for many years to come. People of Reading LOVE Their Buses! For once there’ll be no bus talk from me. Well, maybe a little but nothing too technical, for while the 2014 open day at Reading Buses depot in Great Knollys Street inevitably attracted the usual crowd of bus enthusiasts, the event was aimed at the citizens of Reading who attended in their droves, all coming to admire and pay their respects to the good efforts of their local transport provider. They have a lot to be proud of. The main mission of Reading Buses seems to be good public relations, this being the main core of their recruitment and training, their bus drivers holding a PCV licence only being part of the job requirement. Then there’s the branding. Long gone are the days of the corporation crimson and white livery, each route is identified by a colour which is perpetuated by the vehicles running the service, through the timetable postings and even the bus stop flags, thus if you’re living along the No 17 route then the purple bus IS your bus, and that’s how the customers using the service see it: it is THEIR bus, with the drivers being regarded as neighbours or the local shopkeepers. Backing this up with a frequent and reliable service while being truly answerable and accessible to the customers makes it clear to see why the operation is held in high esteem by the locals. 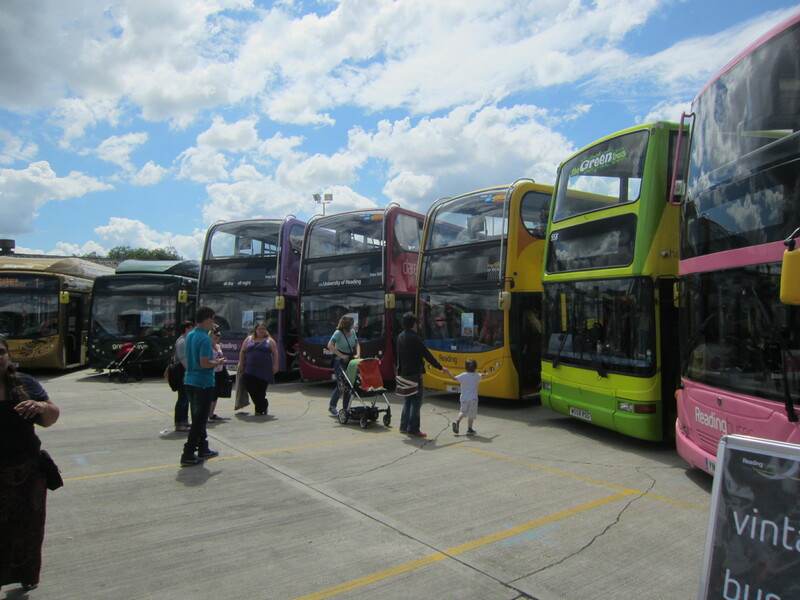 Throughout the open day a selection of vehicles, one of each of the route colours is parked in a semi circle around the trading stalls and partially obscured by other displays and attractions. 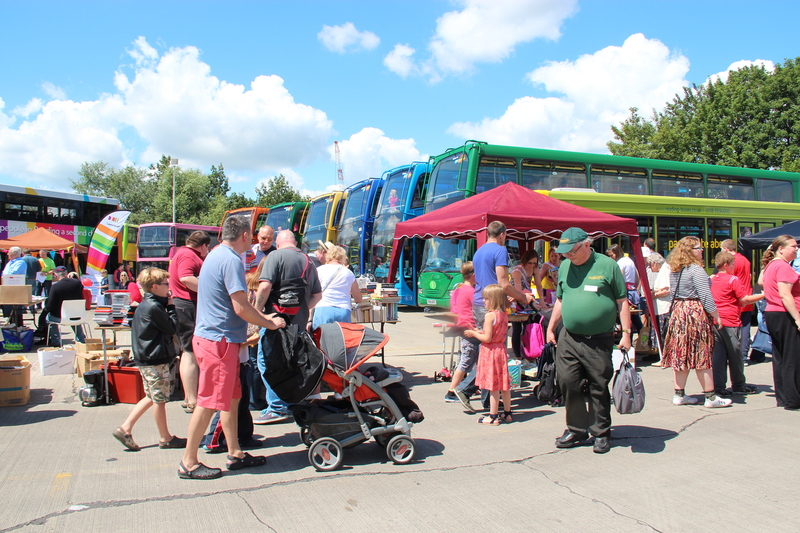 The high point for many comes at the end of the day when the area is cleared to reveal what is referred to as the Rainbow of Buses which then depart in a line to run a cavalcade around the town. The pride and admiration for the local buses was clearly reflected in the sales of our merchandise, with any key ring or magnet with a modern Reading bus being quickly snapped up by those who regularly used them, everybody wanted to take THEIR bus home with them! 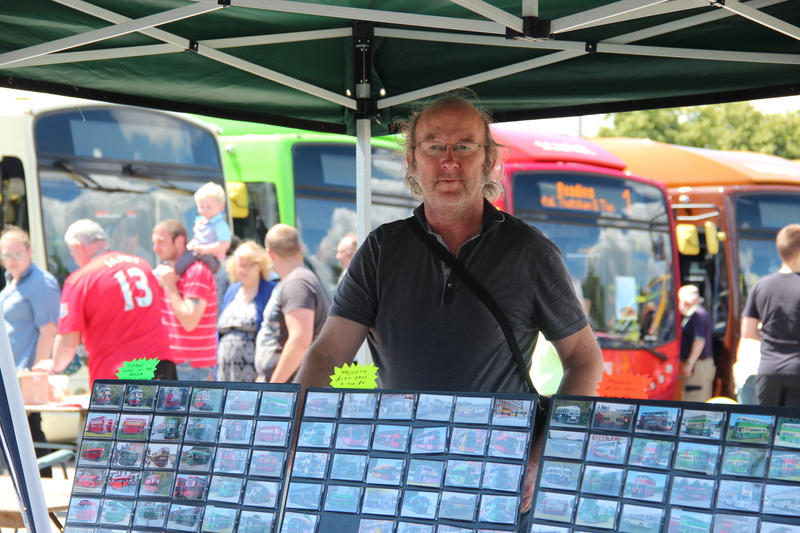 Of course, there were some enthusiasts who bought items depicting the older Reading vehicles but the emphasis was on the modern and the new, this being another key factor in the public image of Reading Buses. 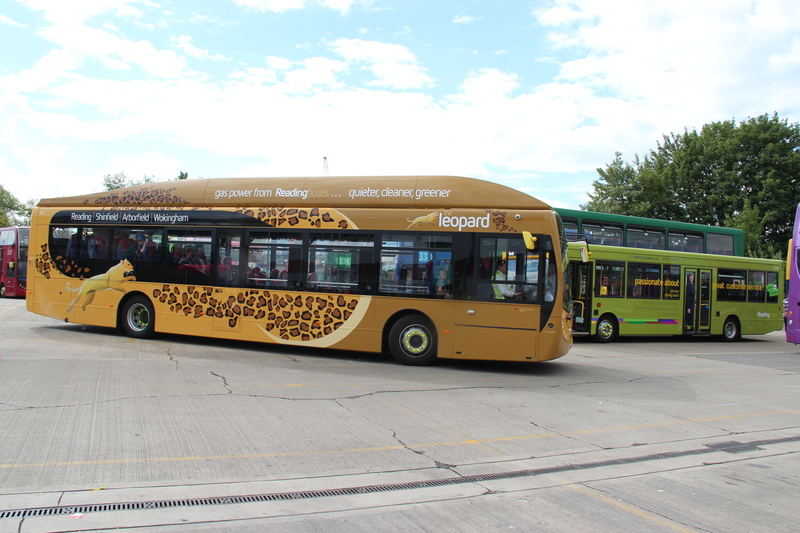 The company have been at the forefront of running vehicles on alternative fuels, be it hybrid-electrics or gas powered buses and they are keen to let it be known on the vehicles and in the service publicity. This has resulted in some people (regular customers as well as enthusiasts) going for a ride just to “try out” the new bus. I have never known a bus operator to be held so dearly by it’s customers. 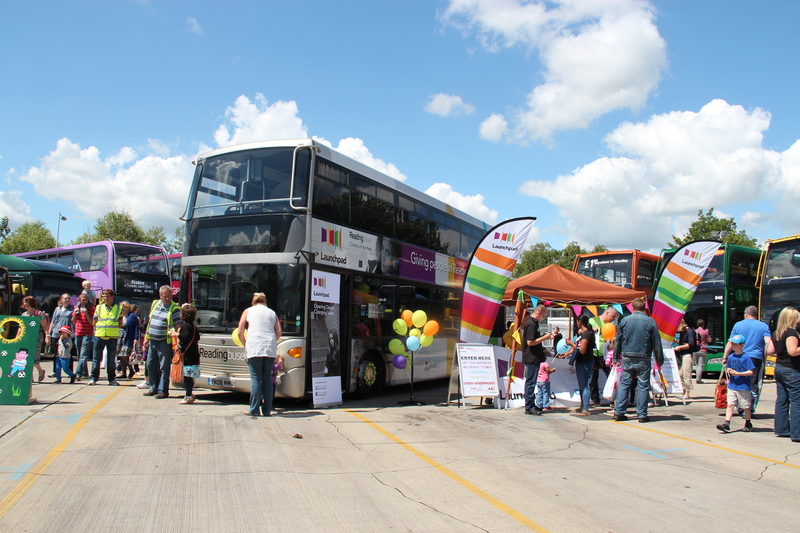 Of course there are other companies who have worked hard at creating a good public image, but the people of Reading LOVE their buses as we discovered when Reading Buses became the first “fleet” in our merchandise to completely sell out at a trading day. The proceeds of the day’s event went to their charity of the year, Launchpad, a local charity that helps the most vulnerable and disadvantaged people in Reading to turn their lives around and fulfil their potential. 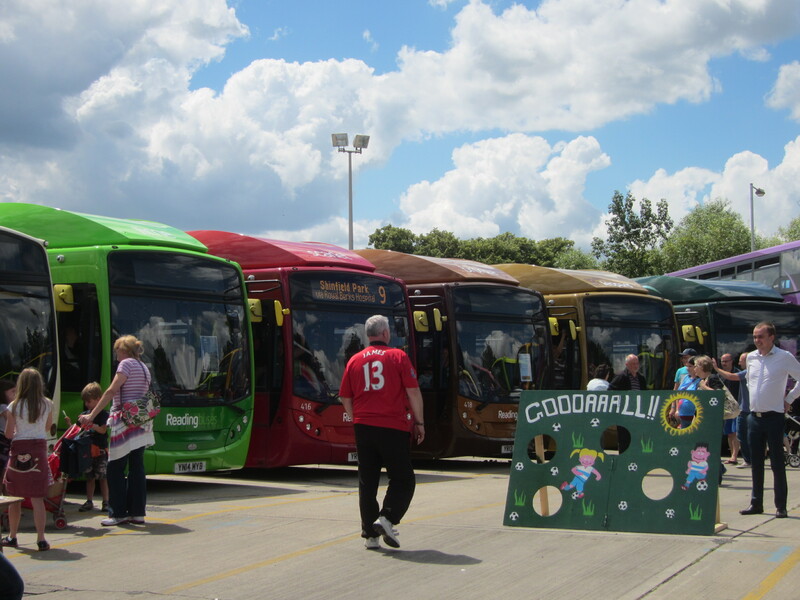 Thanks and congratulations to all at Reading Buses for a very enjoyable day.